Florida rebounded from a loss to Chesapeake earlier in the week with a strong six-goal win over a greatly improved Charlotte team and continues to hold on to third place as the season comes to a close. The Launch came out firing on all cylinders, including a 2-point goal by Connor Buczek and led 7-2 at the end of the first. 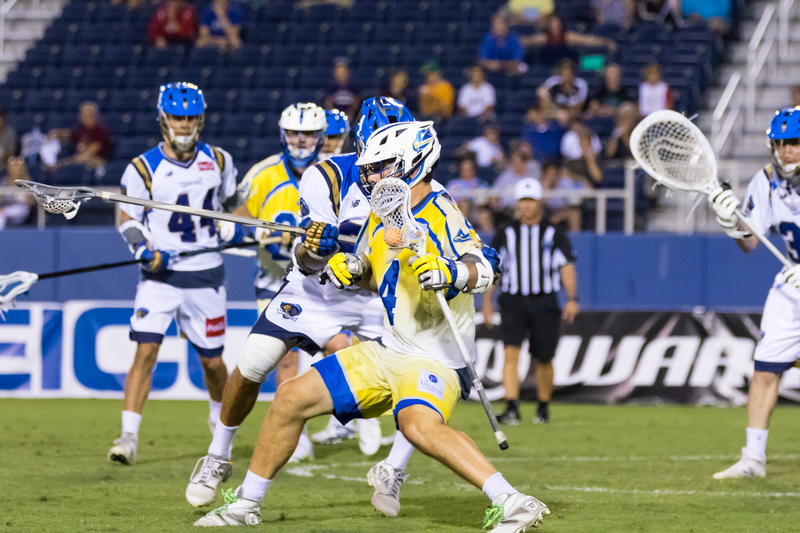 The second quarter proved worse for Charlotte as Dylan Molloy went on a four-goal run of his own and the Launch led 12-3 at halftime. Florida endured a two-goal third quarter offensive output that saw their lead slowly narrow to 14-8. Low scoring quarters proved costly for Florida throughout this season, but the Launch dug down and held on to secure a win, despite a dogged effort by Charlotte. Molloy led Florida with six goals and won rookie of the week honours. Mike Chanenchuk led Charlotte with three goals. Florida won the face-off battle 19-31. Austin Kaut played out of his mind as he made 22 saves while Charlie Cipriano and Pierce Bassett combined for 13 saves. Florida appears likely to secure a playoff spot as they swept New York and Rochester in the regular season while Charlotte needs to win out and get some help to get in the playoffs. Next: Florida faces Boston while Charlotte takes on New York. Chesapeake looked to keep their playoff hopes alive and build on the offensive success they found against Florida earlier in the week. In a very closely contested game against Atlanta, the Bayhawks did just that. In a low scoring first quarter, the Bayhawks ground out a 2-1 lead. Chesapeake found its offense in the second quarter as they led 7-2 at halftime. Atlanta refused to go away, however, and cut into the Chesapeake lead 8-5. Both teams gave their all in the fourth quarter as Atlanta put together a four-goal run to close the gap, but Chesapeake held on for the win. Josh Byrne led Chesapeake with four goals while Brian Sherlock led Atlanta with three goals. The Bayhawks finished with a 17-29 advantage on face-offs. Nikko Amato, the defensive player of the week, went the distance for Chesapeake in goal and made 19 saves. Chesapeake moved into a three-way tie with Rochester and New York with their win while dropped to three games behind the leader with Charlotte. Chesapeake and Atlanta need some help to get a playoff spot as well as winning out the rest of their games. Next: Chesapeake faces Denver and Atlanta takes on Rochester. Denver and Ohio met in the finals last season and dominated the top spot throughout the current season so this meeting drew much attention especially after Rochester defeated the defending champions on July 20. Ohio led most of the championship game last year but an improbable Denver comeback capped a magical season. Ohio has been a team on the verge of championship and looked at this meeting as a chance to for payback. Denver jumped out to an early 4-2 lead in the first quarter, but Ohio roared back with six goals in the second quarter and halftime saw an 8-8 tie. The Machine managed to score three goals in the third while holding Denver to a single tally. The game proved close, as one would expect from last season’s top two teams. While the Outlaws outscored the Machine 3-2 in the last quarter, it was not enough to overcome Ohio’s lead. Connor Cannizzaro led Ohio with three goals as Eric Law led Denver with five goals. Thomas Kelly dominated face-offs, winning 25 of 29 for Denver. Ohio continues to struggle to find consistency at the X. Jack Kelly made 10 saves for Denver while his counterpart Kyle Bernlohr made 16 for Ohio. This left Denver atop the standings with Ohio half-a-game back and it appears both the Outlaws and Ohio are in the playoffs. Next: Ohio finishes the season against New York and Denver faces Chesapeake again.